It may seem a bit opportunistic, perhaps even heartless, but there are plenty of companies that look for people who are struggling with debt and try to exploit them for profit. While this is not true of all credit counseling companies, it is very important to do your research before signing up for one of these programs. In many cases, people end up with much worse credit after working with a so-called "credit repair" company than they would if they used a different approach. Personal bankruptcy might also be considered, but its consequences re much more far-reaching, lasting up to ten years. Meanwhile it will be difficult to obtain credit, buy a home or even get a job. 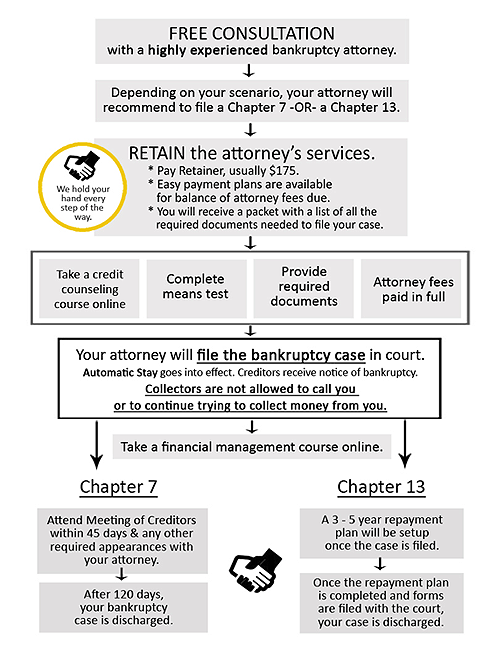 There are two main types of personal bankruptcy: Chapter 13 and Chapter 7. Chapter 13 allows people with a steady income to keep property, such as cars and basic household furnishings, while Chapter 7 involves liquidating all assets that are not exempt. Both types of bankruptcy may get rid of unsecured debts and stop foreclosures, repossessions, garnishments and utility shut-offs, as well as harassment from creditors. However, personal bankruptcy usually does not erase child support, alimony, fines, taxes, and some student loan obligations. You must get credit counseling from a government-approved organization within six months before you file for any bankruptcy relief. Beware of companies that offer "advance fee loans," which guarantee you a loan if you pay a fee to them in advance. Fees range from $100 to several hundred dollars and they are often illegal. Legitimate creditors may require an application or appraisal fee in advance, but they will never guarantee you get the loan, nor will they represent that a loan is likely. If you receive a telemarketing call that offers a guaranteed credit extension after a payment is received, they are breaking a major FTC rule for telemarketing sales. Another suspicious offer might come from a "credit repair" clinic. Many of these companies are specifically targeting people with poor credit histories, promising to clean up their credit reports for a fee, but anything they are offering can easily be done without their help – and without the fee. Remember, no one can remove an accurate piece of information from a credit report; all they can do is correct inaccurate information and request that the credit reporting agencies remove it. Federal and state laws ban these companies from charging money to customers until their services are fully performed. While a debt settlement company might be able to settle your debts, it can take a long time to complete the process. Such programs often require deposits into special savings accounts for three years or longer before all the debt can be settled. Before signing up for such a program, be sure to review your budget carefully and make sure you can keep the payments up for the full term of the agreement. Keep in mind that while they attempt to reach agreements with your creditors, neither party is obligated to settle your debts, so you could continue to accrue interest on some accounts before they are paid off. Plus, because the program will discourage you from sending payments to creditors, your credit could be severely damaged by this process. If you are considering a credit repair or debt management program, take the time to carefully select the company and make sure you understand all the terms of their contract. While many of these businesses are legitimate, others are only interested in taking your money. If you’re like many other Americans, you may think that bankruptcy is just another word for being broke, or not having any money, but in this age of extended credit, how do you define ‘broke’? When do you know when you don’t have any money? This can be a complicated problem, because many people may think to themselves, “well, I have a job and I’m making money, so I’m not broke”. Unfortunately, the sad fact of the matter is that it is possible to be broke, or insolvent, while still earning money from a job. With the practices of today’s predatory lending companies, who encourage you to spend and create debt for yourself, it can be all too likely that you’ve racked up more debt than you can easily pay off. You can end up paying off interest on credit and giving the bank far more money than you originally borrowed, and that’s money that isn’t going to feeding your family and paying your bills. In cases like these, filing for bankruptcy may be just the help that you need. With the help of an experienced Colorado bankruptcy attorney, many of your debts can be flatly forgiven, and others can be made to work with you to create a payment schedule that doesn’t interfere with your quality of life. Far too many people wait too long to file for bankruptcy because they don’t think it applies to them, or they don’t think it would help them. Don’t wait to consult with a bankruptcy attorney, because some even give free consultations. It could change your life!